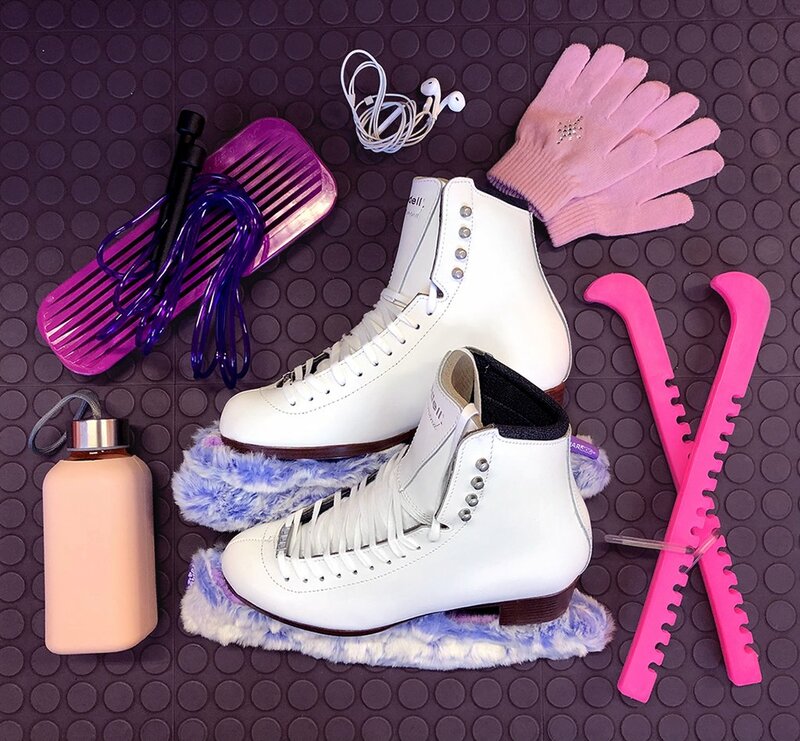 Figure skating accessories might seem like a small part of the sport—but these items can play a major role in a skater’s everyday life. What they carry in their bag may seem trivial, but this gear can make or break how a practice might go or how stressful a competition may be. Planning ahead and figuring out what to keep in each of your figure skating bags is essential to the sport. Figure skating is already quite demanding, so you don’t want to add the stress of not being sure you packed an extra pair of tights when yours get a run in them on the day of an important competition. At Riedell, we’re passionate about providing all the advice skaters need to succeed. So today, we’ll be diving into the items every skater should bring in their practice and competition bags. What’s Inside a Skater’s Practice Bag? A skater’s bag will likely look a lot different when they are heading to practice versus a competition. Your practice bag may not require some of the items your competition bag will. So then, what are some of the things you might find inside a skater’s practice bag? Something that a figure skater should always keep in their practice bag is extra layers. The ice skating rink can be quite cold at times, and if you are not fully prepared then your muscles can get cold—making it hard to practice. Plus, having the option to take layers off if you get warm is better than not being able to put them on when you’re cold. Of course, some of the most important items to keep in your skate bag are your skates. No skater wants to get to practice and realize they left their skates at home. Making sure they are properly cared for is also important, so keeping skate guards in your bag is also important. A skater should wear their skate guards when they are not on the ice in order to protect the blades and keep them sharp. During practice, you’re likely to accumulate a lot of moisture and water on your skates and other accessories. You’ll want to have a dry cloth to wipe your skates off to keep them protected from the elements. After drying off your skates and blades, put terrycloth soakers on the blades to wick away any moisture and condensation that forms on the blades. Along with having extra layers, you’ll want to bring along a spare outfit. This can be something you change into after you practice—or even just another practice outfit in general in case the one you’re wearing gets wet or ruined in some way. Having a clean, dry outfit to change into after practice will make any skater much more comfortable. At practice, you’ll likely become sweaty from all the hard work you’re putting in. Having a water bottle is essential to stay hydrated and focused throughout the entire lesson. Having healthy snacks will also be beneficial after a long, strenuous practice. What’s Inside a Skater’s Competition Bag? While there are many items that you will also have in your practice bag, your competition bag may include some things you won’t necessarily need in practice. Making sure that you have all the correct registration information is crucial to a smooth competition day. You’ll want to have documents that include your event number, time of competition, rink, and more. You don’t want to be frantically trying to figure out when your warm-up time is and end up missing it altogether. It is critical to have multiple copies of your music when you’re heading to a competition. Make sure you give a copy to your coach to ensure that more than one person has it. You should have another copy for your warm-up or practice time, too. Having extra tights is crucial for a competition day. You don’t want to worry about getting a run in your tights and not being able to fix it with clear nail polish. Packing an extra pair will be a lifesaver in these situations. The same goes for extra competition outfits. Having just one extra can be beneficial in case yours gets damaged and can’t be used. While most skaters get ready before they get to the rink, having some makeup or hair accessories for touch-ups can be beneficial. Include items such as hairspray, hair ties, and blush. Being properly prepared for practice or a competition by having all of the necessary equipment and accessories can help relieve a lot of stress for skaters. Making sure you have the proper skates is essential to help you feel prepared. With Riedell, you can get custom-fitted skates tailored to your unique feet. Contact us today about finding your perfect skates!